Great technique from Chloe Pearse. Score, look for camera, wave. The results in Week 10 threw the cat in amongst the pigeons at the top and the bottom of the Women’s All Ireland League, and all this despite the cancellation of the fixture between Blackrock and Old Belvedere. At the top of the table those wonderful old warhorses at UL Bohemian made amends for last weeks loss to Old Belvedere with a resounding win against Railway Union. 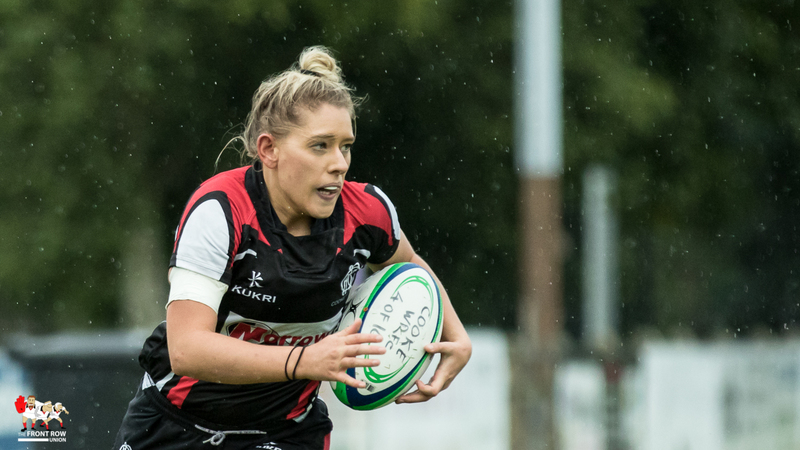 After a first half largely dominated by Railway, the home side were able to dig deep and find a way to win as fullback, and try scorer, Aine Staunton told the Front Row Union. As for Railway, this was their second defeat to Boh’s this season and their fourth loss to the Limerick side in five outings over the last two seasons. We asked Railway’s Canadian International Emma Taylor if it was starting to become an issue for the Dublin club? While Railway will no doubt come back from this setback they will be particularly disappointed that their destiny is no longer in their own hands and they will have to rely on someone else doing them a favour if they are going to finish at the top of the table. The four match run in for the two teams is as follows. Unfortunately our other featured match for Week 10, Blackrock v Old Belvedere, was cancelled due to the weather. It’s disappointing as we wanted to catch up with a resurgent Old Belvedere but that will have to wait for another day. In Saturdays other match, Cooke v Tullamore, the Belfast side consolidated their position in the top four thanks to a comfortable 34 – 10 win against the Offaly outfit. Cooke’s tries came from Amy Graham (2). Emma Jordan, Alanagh Chipperfield and Jemma Jackson, the latter adding three conversions and a penalty to the total. Tullamore’s tries came from Emer Phelan and Clodagh Hanniffy. The win will be a relief for Cooke who had lost their previous three league games but the defeat, coupled with other results, sees Tullamore hit the bottom of the table and boy oh boy do they have a difficult run in! Yep, after beating Cooke last week it was another “WTF Galwegians” moment as they lost out 22 – 14 to Highfield in this bottom of the table tussle. Highfield picked up a precious bonus point in the process which lifted them a point clear of Tullamore at the bottom of the league. Their tries came from Heather O’Brien (2), Alice Brislane and Linda McNamara with Denise Redmond and Sarah Cassidy responding for Galwegians. All this leaves the table as follows. Next Article Christian Lealiifano, a bright light in a time of darkness?